Pictured at left back row, l. to r.: Inspector John Seward, Recording Secretary Zach Hayes, and Iowa Rep Tom Dye. Front row, l. to r.: President Robbie Gant, BM-ST Scot Albertson, scholarship recipient Samantha Hicks, Kenneth Hicks, Trustee Dave Delgado and Trustee Danny Eastwood. Molly MacDonald, daughter of Local 580 (Halifax, Nova Scotia) member Paul MacDonald, is a graduate of Hants East Rural High School. She is working toward her Bachelor of Arts in history at University of King’s College. LOCAL 13 (Philadelphia) selected winning applicants for two Jeffrey C. Davis Awards and 21 academic scholarships. The Jeffrey C. Davis awards are funded by the family of Jeffrey C. Davis, an apprentice who died in a 2002 job-site explosion. The Local 13 scholarship committee does not release the names of scholarship winners for publication. 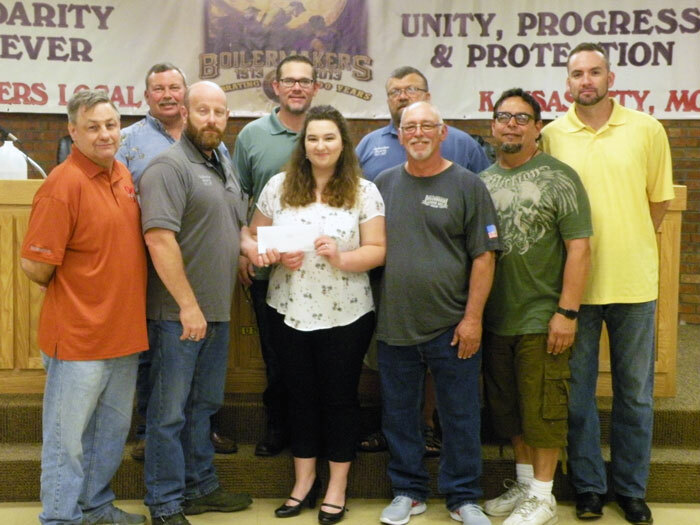 LOCAL 83 (Kansas City, Missouri) awarded scholarships to five dependents of local lodge members. Pictured at left back row, l. to r.: Inspector John Seward, Recording Secretary Zach Hayes, and Iowa Rep Tom Dye. Front row, l. to r.: President Robbie Gant, BM-ST Scot Albertson, scholarship recipient Samantha Hicks, Kenneth Hicks, Trustee Dave Delgado and Trustee Danny Eastwood. Not pictured are scholarship recipients Cassandra Daniels, daughter of Scott Daniels; Sophia Henneman, daughter of Arthur Henneman; Josey Johnson, daughter of Matthew Johnson; Richard Peve, son of Richard Peve II; and Emily Schroeder, daughter of Darrin Ryder. FOUR DEPENDENTS OF Local 105 (Chillicothe, Ohio) members received a $1,000 Don Storey Memorial Scholarship. They are Robert Conaty, son of Robert Conaty; Kayle Gallion, daughter of Timothy Gallion; Baylei Park, step-daughter of Scott Kellogg; and Michaela Potter, daughter of Michael Potter. LOCAL 146 (Edmonton, Alberta) selected winning applicants for two academic scholarships. Pristina Mendoza, daughter of Ernesto Mendoza, received a $2,000 award. Losan Shishani, daughter of Maher Shishani, received a $1,000 award.